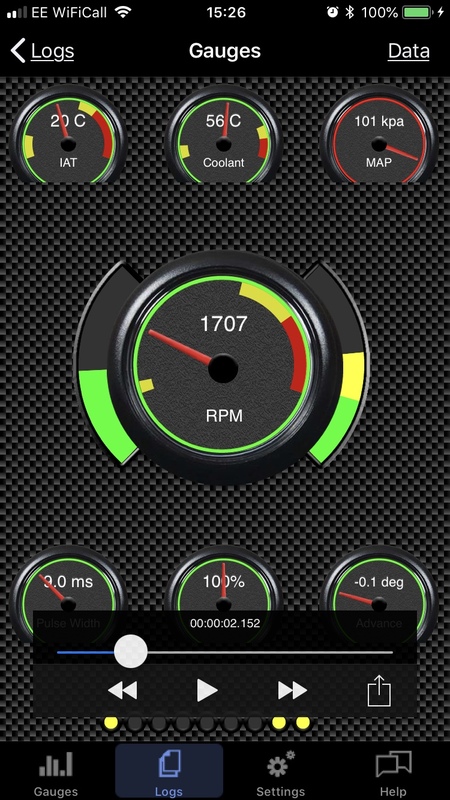 Once a connection is established (progress indicator full on the realtime gauges view), the log record button will appear (top left of the central large dial gauge). Tapping the button will start logging your data into a logging session. Logging is indicated in three ways in the app. The symbol on the log button changes from a round “record” symbol to a “pause” symbol. The log “mark” button will appear on the gauges view (top right of the central large dial gauge) and the small red indicator at the bottom right of the gauges view will appear. If the connection to your MegaSquirt is lost/interrupted logging will automatically stop. Using the “mark” button places a mark/comment into the log file that can be used to indicate a specific event you want to look at in the log viewer application. There is an alert sound played when you use the mark button to indicate it has been successfully added. Selecting the “Logs” tab in the app allows you to view and/or replay your log files. The first view lists your recorded logs with the newest at the bottom. You can delete log files using this view by left swiping on the log file you want to delete. Deleting a log file from the list permanently removes the log from your device. 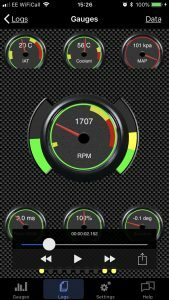 To replay a log file simply tap on the one you want to view and the gauges view will appear together with a controller to play/rewind/fast forward through the log file. You can also use the slider to select a position in the file. 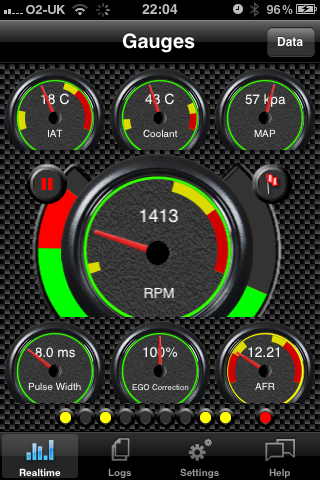 The gauge view can be scrolled up/down to reveal areas obscured by the control panel. Note that the data view also reflects the logged data if you want to view data that isn’t available in the gauge view. Use the “Logs” back button to return to your list of log files.